Try Using The Heat And Stick Powder Technique With Dazzling Diamonds To Create Some Sparkle In Your Craft Work. Have you tried the Heat and Stick Powder yet? 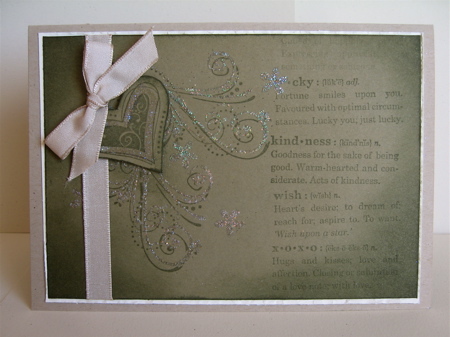 I find it works beautifully with Dazzling Diamonds from Stampin' Up!, to give a permanent glitter to your designs. By permanent I mean it will not rub off (unlike a lot of other glitter adding techniques) once it is set and the excess is brushed away. This technique can be used in a bold or subtle way on your cards, boxes or other creations, and today I have a couple of examples showing you some ways the Heat and Stick Powder technique can be used. Do you love a little glitz added to your cards? If the answer is "yes", then the Heat and Stick Powder Technique is one technique you'll want to master. 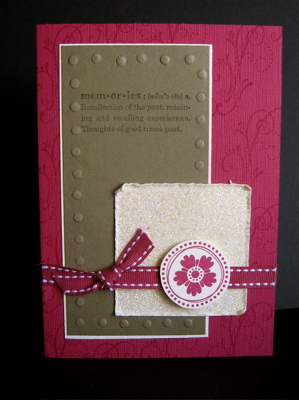 It is really quite straight forward and follows along similar lines to regular embossing. 1. Rub over the card stock with your Embossing Buddy then load the rubber stamp image with Versa Mark and stamp onto your card stock. 2. Sprinkle a generous amount of Heat and Stick Powder over the image, then tap off the excess back into the jar. 3. Apply heat to the image using the Stampin' Up! Heat Tool, and heat until just tacky. 4. Quickly cover the tacky area with the Dazzling Diamonds Glitter , tap off the excess and apply more heat from the Heat Tool. Just a word of warning here to be careful with this last step - it's quite possible to overheat - if you do, you'll end up with a dull rather than glittery finish. I have not experimented widely with other glitters, so cannot tell you just yet what effect the heat has on them. I love the Dazzling Diamonds so much because it seems to pick up the colour from whichever card stock you're working on. Have I confused you? Here are the steps in a simple format. 1. 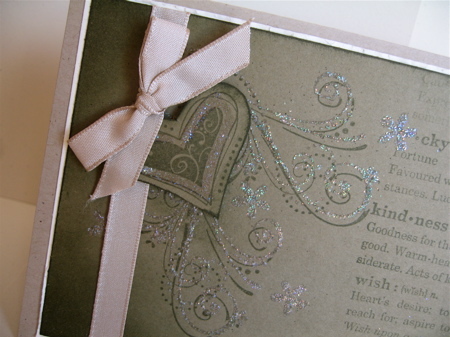 Apply Embossing Buddy to card stock. 2. Stamp image in Versa Mark ink. 3. Cover with Heat & Stick Powder. 4. Tap off excess H&S Powder. 5. Heat until just tacky. 6. Sprinkle with Dazzling Diamonds or glitter of your choice. 8. Allow a couple of seconds to cool. 9. You now have a permanent glittery image. This detail shot shows using the heat and stick powder and glitter (dazzling diamonds) to create a background strip for the motifs. 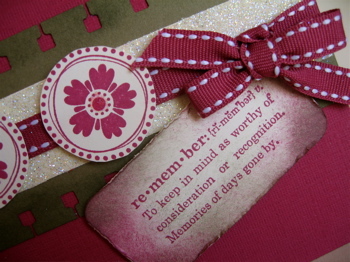 I have used the lovely and very versatile Priceless stamp set, plus the Life Definitions set - both from Stampin' Up! It took me a while to discover the Life Definitions set - it seems to hide in the catalogue way back on page 126. I am sure I didn't even know it existed until I heard some other Stampin Up demos raving about it. I now know what they are talking about - it is wonderful - so finely etched and you can see the clarity of the lettering in the detail photo. This is a full shot of the card. All images Stampin' Up!, art work by Ann Craig. 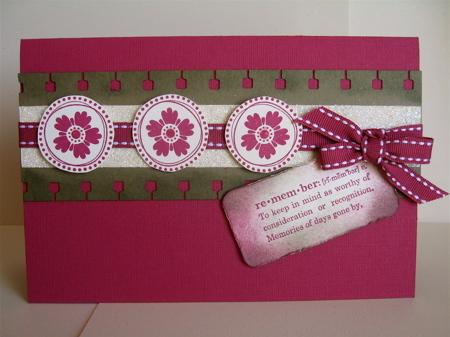 Other products I've used are: Purely Pomegranate textured card stock, PP double stitched ribbon,Very Vanilla card stock. Purely Pomegranate and Always Artichoke classic inks. Here are a few more photos of some other cards I made using just one 12 x 12 sheet of Purely Pomegranate textured card stock, 1 x A4 sheet of Very Vanilla and 1 x A4 sheet of True Thyme, the Priceless stamp set, Life Definitions stamp set and some Stampin Up accessories. I've used my Cropodile to dry emboss around the edge of the Thyme stock, and stamped the swirly motif on the background in Purely Pomegranate ink. Just learning to use the cropodile with the guide from the mat pack, but I did manage to get 3 out of 4 lines straight! Hope you don't mind seeing "less than perfect" examples, but we're all human, and I like to think that this shows that it is indeed "hand made". 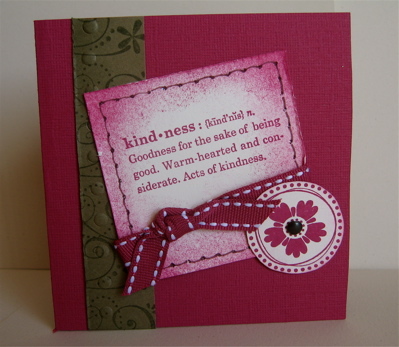 The other little card below is made from left overs of card stock. I again used the cropodile and added some faux stitching. Don't you just love that double stitched ribbon? I find this colour scheme very soft - Very Vanilla, Kraft and True Thyme (2007-2008 In colour series). I used Always Artichoke ink to create the darker areas, and to sponge around the edge of the card. Heat and Stick Powder was used on the swirls then the "shadowing" and Life Definitions were positioned using the Stamp-a-ma-jig. Everything was tied together with some Kraft Taffeta Ribbon, and the heart was raised up with dimensionals. The detail shot shows the Dazzling Diamonds up quite well. If you would like further information on this technique or any of the products used, OR would like to purchase any Stampin' Up! products please contact me and I will be happy to help. If you would like to see other examples and techniques you can find them in past posts on my blog. Use this link to navigate back there. Would you like to learn more about Stampin Up?